Check Your CIBIL Score & Report absolutely free in next five minutes. BANKS CHECK YOUR CIBIL SCORE BEFORE APPROVING YOUR LOAN* - Get your free CIBIL Score and apply for a customized loan. CIBIL Score check by Banks / NBFC is the first step whenever you apply for any loan or credit card by using your PAN CARD. If you’re CIBIL Score is 750+, then your loan / card application is further processed. If you have settlement in last one year or CIBIL score is below 750 points your application will be rejected automatically. So before apply for Loan / Credit card you can check your CIBIL Score with Deal4loans free of cost. You just have to enter few Details and Report is in front of you within few seconds. 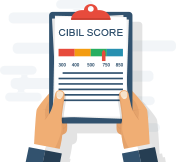 Here’s the Step which you have to follow to know your Cibil Score. Your Full Name as per PAN Card. Contact Details – Residence Address, Pincode, State & City. Tick Box for Agree to the terms and conditions. Submit this information & Results on your Screen. Looking to apply for a loan or credit card in coming days; so before apply check your credit score first!!! Minimum 750 CIBIL Score required to approve loan or credit card. You credit score calculations depends on below mentioned point's which helps credit bureau to calculate your cibil score. Last 3 year’s calculation of your loan emi's & bill's.